Is Google Maps Piggybacking off of Yelp (Again)? I just saw something I’ve never seen: an organic search result for a business listed on Yelp.com, with a gray Google Map pin as part of the search result. 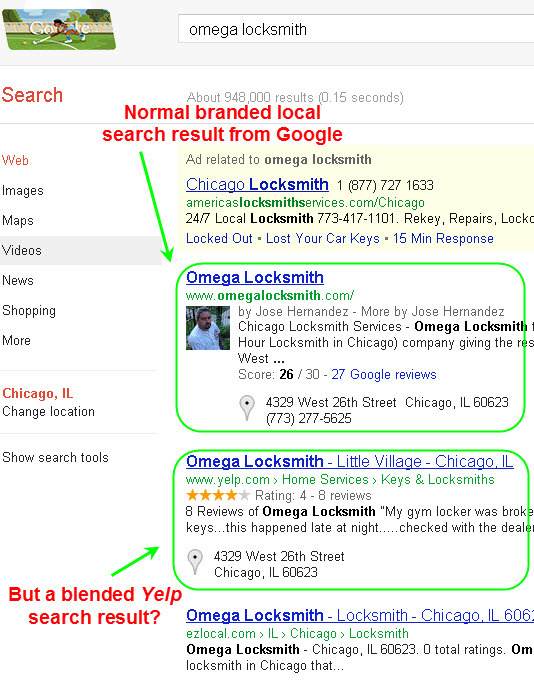 So, no, it wasn’t an accident: the “blended” Google local search result had the gray map pin, as it always does. But the Yelp search result had it, too! The map pin links to maps.google.com – the “Maps” tab – of course. I’ll be on the lookout for more instances of this. It’s probably a test, but if it is, I don’t know the scope of it at this stage. 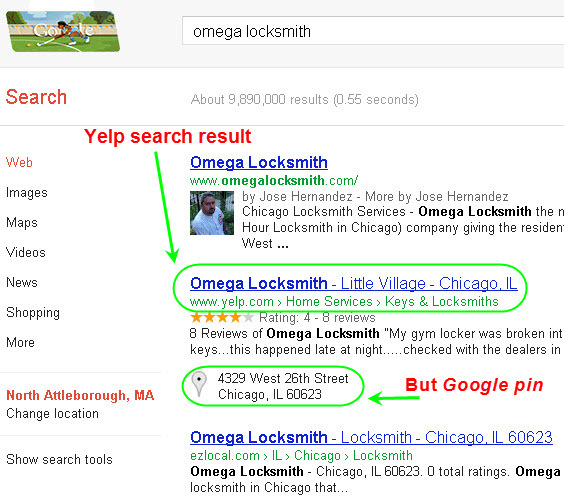 My thought is Google may be moving in the direction of duly giving Yelp reviews special prominence – at least in the organic results, albeit not on businesses’ Google+Local pages. That would be a nice symbiosis. Dare we say it’s the birth of “blended Yelp search results”? On the other hand, maybe Google is just trying to siphon off some visitors who’d click on Yelp results. On the third hand (wait a minute…), maybe Google isn’t doing anything right now and it’s just a short-lived test. Whatever the case, it would be a strange partnership – but who doesn’t like a strange partnership? Note: check out Mike Blumenthal’s post about an observation similar to this one. Ah, interesting (the one day I didn’t check Mike’s blog!). Obviously, these aren’t the same two phenomena, but they do seem to be “cousins” of sorts. The business I cited does have a Plus page, too, so Mike’s theory does seem to hold true here. But the role Yelp plays here I can’t figure out – and it’s especially weird that the same business has two gray pins. It looks like we’re seeing different facets of the diamond. I’d LOVE any further thoughts/intel you have. Thanks for weighing in, as always! Very often Google shows (or at least was showing) local Plus Box under listings on business directories. I’d most frequently seen it on Yelp, Superpages, Kudzu, the ones that have a map together with the listing. I’ve been doing some research on this Plus Box, part of which I shared here: http://www.searchenginepeople.com/blog/local-search-plus-box.html and I am still planning of doing a sequel, but let’s see how things go 🙂 Pretty much everything tells me these are the re-designed plus boxes. P.S. I didn’t even read the article of Mike before I saw your comment, I just checked the screenshots this morning… And yep, it seems like he thinks the same way. It may just be 4 years of this stuff sloshing around in my head, but I don’t remember any Plus Boxes with organic search results for directories. Just Plus Boxes for branded search results for one’s own site. But it’s entirely possible I’m just forgetting a piece of local-search history (I’d sure appreciate any screenshots)! Ouch, I don’t think I have screenshots of this, but I’ve been seeing it really very frequently recently, especially while I’ve been doing some citations researches. Gotcha – I think I see what you’re saying, that you’ve seen the map pin under directory search results recently, but not like 2 years ago (?). If so, then that adds up – at least to me. What you said about the embedded Google Map makes perfect sense: Yelp listings do those. Of course, if this is true, things could get weird fast: if a search (by name) for a business returns local results for a bunch of directory sites, and each has an embedded Google Map, there could be some serious map-pin proliferation. I think Nyagoslav pretty much nailed this, Phil. My sense is that we will start to see more “new plusboxes” proliferate for anything marked up with hcard/schema address formatting. At some point it will probably shrink back down to the most authoritative page marked up in that fashion, however. What you and Nyagoslav have said definitely adds up. I still wonder, though, whether hCard/Schema is the main driver here: we’ve seen this with Facebook results (as Eric kindly pointed out), and I’m not sure whether microformats play a role there. That’s a mystery to me, but it’s more than possible you guys are seeing something I’m not. Just Tweeted and Scooped and it will be added to the new Local Search Forum too. Thanks, as always, for stopping by and for spreading the word! I think this latest morphing of the Plus Boxes may throw off a lot of people (I know I’m guilty as charged), but I know we’ll be able to get a better grip on it at the forum. 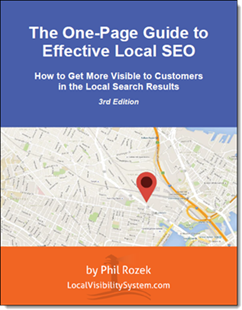 Saw this with another directory that’s authoritative in Google’s eyes: goo.gl/QRUj5. Is there anything in particular that you think would inform Google which domain is more authoritative than the other (in this example, the firm’s website vs. the directory listing)? Great example, Vladdy – thanks! If I understand the question correctly, you’re wondering how Google might select which directory sites (of all the directory sites that show up in the organic results for a specific business) get the gray map pin (AKA “new Plus Box”)? If that’s what you’re wondering, I’d say that what Nyagoslav said seems to explain it, at least partially: embedded Google Maps seem to be a factor, and many directory sites don’t have them, so that MAY disqualify many of the directory sites right out of the gates. But beyond that, I think it’s just a matter of Google’s organic algo: there are any of number of factors that make Google consider FindLaw.com more authoritative than SuperLawyers.com. I’m pretty sure we have the same level of insight into exactly what those are. One thing I’d be interested in discovering over time is whether vertical-specific sites (like FindLaw) tend to get this new breed of Plus Box more often than the BIG horizontal directories like Yelp.